Precision Jet Spray and Vibrating Cleaning Head tackle dirt and stains. The iRobot® Braava jet™ Mopping Robot tackles dirt and stains in hard-to-reach places, like under kitchen cabinets and around toilets. 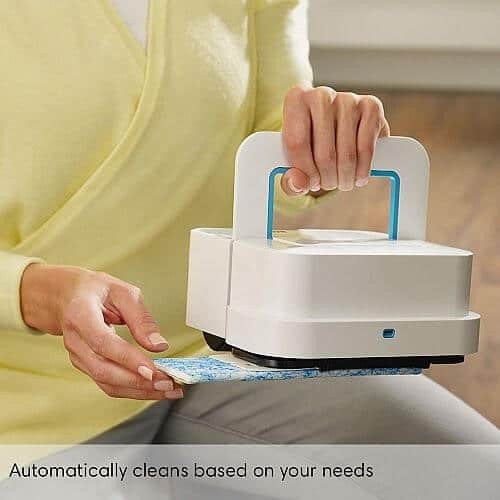 Just attach a Braava jet™ Cleaning Pad and the robot automatically selects wet mopping, damp sweeping, or dry sweeping. 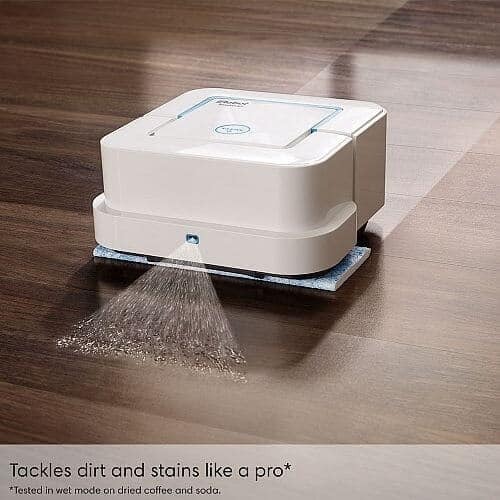 Braava jet™ is designed to clean hard floors. For dry dusting, it’ll cover the room once with little overlap. The damp cycle covers everything twice, and wet mopping uses more water and goes over it all three times. Both the damp and wet modes employ the Jet’s water nozzle to spray the area in front of it. You’ll fill the reservoir with water before each run, which will activate the cleaning agent in those specific pads once they get wet. 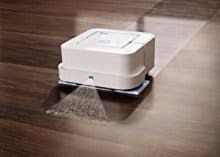 Cleverly, the bot will wipe an area, then back up and spray what it just covered before wiping it again, which helps it avoid accidentally spraying any furniture. 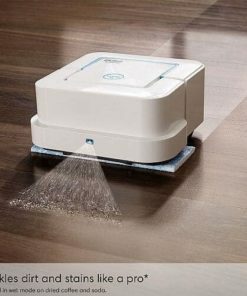 Cleans floors in an efficient, systematic pattern: Braava jet™ mops and sweeps small spaces, such as kitchens and bathrooms, with an efficient, systematic cleaning pattern. Smart design gets into tight spaces: With its square shape and compact size, Braava jet™ gets into hard-to-reach places, including under and around toilets, into corners, and below cabinets. 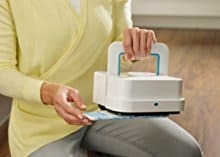 Carefully cleans around obstacles: Braava jet™ remembers obstacles in its path and slows down to gently clean along furniture, walls, and fixtures. Avoids stairs and riding up on rugs: Cliff Detect keeps Braava jet™ from falling down stairs and other drop-offs. Braava jet™ avoids riding up on rugs. 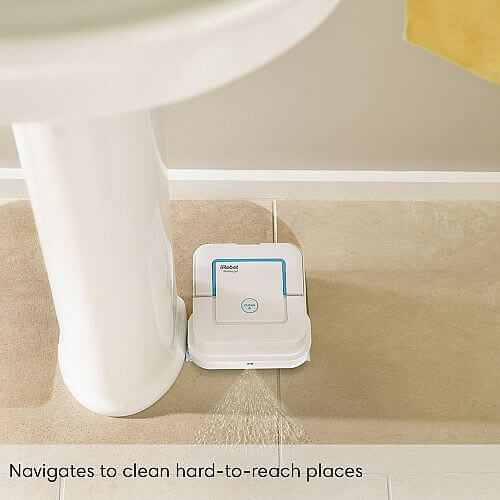 Knows its way back: Braava jet™ returns to its starting point after completing a cleaning run. Knows when to power down: Braava jet™ automatically shuts off after a cleaning run, or if it encounters a problem. Braava jet™ goes only where you want it to: Create an invisible boundary with Virtual Wall® Mode to keep Braava jet™ in rooms without a door, such as kitchens and entryways. 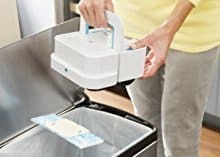 Eject Braava jet™ pads at the push of a button: With the easy Pad Eject button, you’ll never touch grime or grit on the cleaning pad from start to finish. Easy to store: Compact size makes Braava jet™ easy to store. Quiet operation: Braava jet™ won’t disrupt daily life as it cares for your hard floors. Extremely portable: Lightweight design features a convenient handle for easy portability. Targeted spray tackles dirt and stains**: Precision Jet Spray† loosens dirt and stains. Braava jet™ searches for obstacles in its path before it sprays to help protect furniture, rugs, and walls. 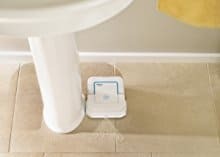 The iRobot Braava jet Mopping Robot tackles dirt and stains in hard-to-reach places, like under kitchen cabinets and around toilets. 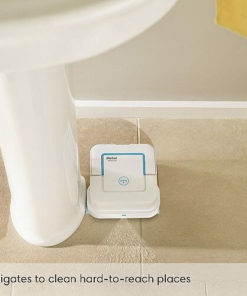 Just attach a Braava jet Cleaning Pad and the robot automatically selects wet mopping, damp sweeping, or dry sweeping. 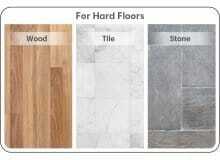 Braava jet is designed to clean hard floors including hardwood, tile, and stone. The Braava jet robot mop is designed to mop and sweep all hard floor surfaces, including hardwood, tile, and stone. Always follow manufacturer or installer instructions when cleaning your floors. Precision Jet Spray loosens dirt and stains. Before it sprays, Braava jet searches for obstacles in its path to help protect furniture, rugs, and walls. Tested in wet mode on dried coffee and soda. Precision Jet Spray used only in Wet Mopping and Damp Sweeping Modes. 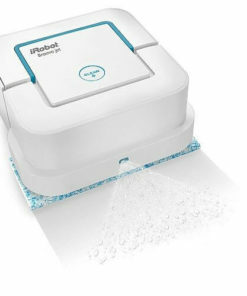 The robot mop’s Vibrating Cleaning Head gently scrubs dirt and stains. Vibrating Cleaning Head used only in Wet Mopping and Damp Sweeping Modes. Tested in wet mode on dried coffee and soda. Braava jet mops and sweeps small spaces, such as kitchens and bathrooms, with an efficient, systematic cleaning pattern. With its square shape and compact size, Braava jet gets under and around toilets, into corners, and below cabinets. Braava jet automatically selects the correct cleaning method based on pad type. Simply attach the pad of your choice and press Clean on the robot. Choose from Wet Mopping, Damp Sweeping, and Dry Sweeping pads. 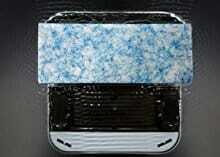 Eject and discard Braava jet cleaning pads at the push of a button, without ever having to touch grime or grit. 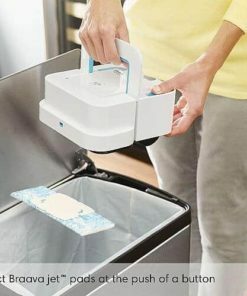 Just press the easy Pad Eject button and drop the pad into the trash. Create an invisible boundary with the built-in Virtual Wall Mode to keep Braava jet in rooms without a door, such as kitchens and entryways. Braava jet remembers obstacles in its path and slows down to gently clean along furniture and walls. Plus, Braava jet avoids stairs and riding up on rugs. FREE 1 year extended warranty on Robot by AutoVacBot. (For purchase from AutoVacBot only). *Charging base voltage is compatible with Malaysia Voltage & Malaysia plug is provided. * Always follow manufacturer or installer instructions when cleaning your floors. **Tested in wet mode on dried coffee and soda. ***Precision Jet Spray used only in Wet Mopping and Damp Sweeping modes. ****Vibrating Cleaning Head used only in Wet Mopping and Damp Sweeping modes. How does Braava jet® work? Braava jet® mops and sweeps kitchens, bathrooms, and other small spaces in an efficient, systematic cleaning pattern. 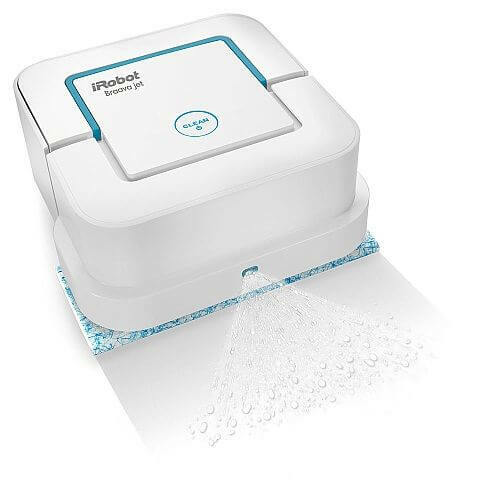 It automatically selects the correct cleaning method based on pad type and tackles dirt and stains* on hard floors. How is Braava jet® different from other Braava® models? Braava jet™ provides focused cleaning of everyday messes in smaller spaces such as kitchens and bathrooms. 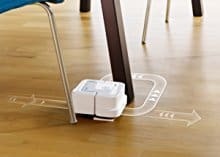 Braava® 380t is the floor mopping robot for multiple rooms and larger spaces. 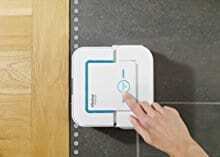 How is Braava jet® different from Roomba®? 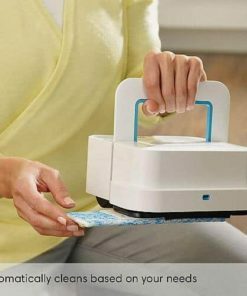 Not at all- just attach a Braava jet® Cleaning Pad and press CLEAN! Braava jet® automatically selects the correct cleaning method based on the pad type you’ve chosen. 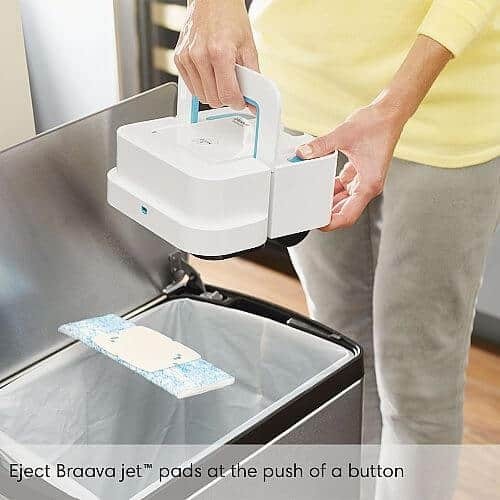 When Braava jet® finishes cleaning you can eject and discard pads at the push of a button without touching grime or grit. *Precision Jet Spray and Vibrating Cleaning Head used only in Wet Mopping and Damp Sweeping modes. **Always follow manufacturer or installer instructions while cleaning your floors. For English manual, please click here. For Chinese manual, please click here. For Quick Start, please click here. So happy I have my own Braava now! Works totally great! 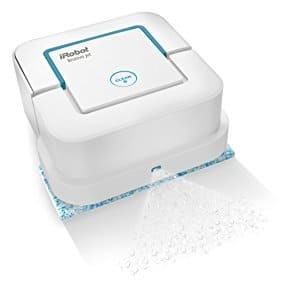 Working just fine, convenient robot mop. Very convenient and the size fits well , it went under my bed smoothly. Indeed it is very small but loved the water spray and scrubbed well my tiles!